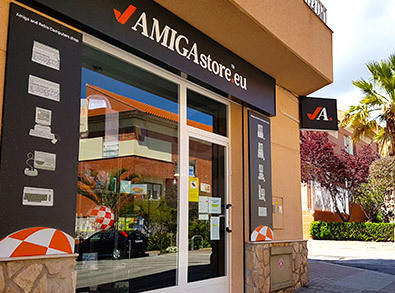 We are a bricks-and-mortar retail store in Lorca (Spain) as well as an online store which has been offering you Amiga products since 1999. We have completely reshaped our operations in 2013, in order to provide highly professional services to demanding and specialized customers. We are not just a website. We have a whole supporting infrastructure relying on real people who have carried this project forward with enormous effort, dedication and care. We will be delighted to welcome you to our store in Lorca and explore together the Amiga world and that of alternative computing. matter of making a sale. We are truly keen on providing our customers with a helpful service and the best experience possible. Our aim is efficiency, to which we are fully committed. We guarantee that your order will be processed and shipped the same day you place it, provided we receive it before 4pm local time, Monday through Friday. Should you have any doubt, feel free to fill in our simple enquiry form or give us your phone number. Isabel or Maria will contact you immediately. Our technical department is made up of Amiga experts. We repair hardware and perform software configurations. If you so wish, don’t hesitate to ask for technical advice on any Amiga product: Guillermo and Juan will be glad to give you a helping hand, completely free of charge!. You can count on the reliability of a bricks-and-mortar store. We have been operating from these premises for quite some time now so rest assured, we are not going anywhere. We have created a store that makes us proud, but we are aware there is always room for improvement: feel free to be critical. We mean it. We will be happy to know what you think of us. Send us both your comments and suggestions so we can learn from our mistakes. For any question about a product from our catalog, or a product out of catalog. If you have a shop and you are interested in one or more products our products from our catalog.